The search for a fresh purity and distinctiveness in bathroom design can come to rest in the expression of almost a basic straightforwardness found in the clear cut lines of the Legato bathroom. However, that would be under-stating the sophisticated expression of straight lines and the illusory simplicity which is so dominant in this collection. There is a boldness and almost an audacity in the way in which elegance is cradled in functionality. Suitable for high-end luxury, new developments, the Legato bathroom collection of 2015/16 is a Villeroy and Boch triumph, and an example of their long running contribution to homes of class and distinction. The washbasin tantalises, seeming to float above the vanity unit. At night the effect can be further enhanced by LED lighting. Appearing shallow, but in fact a deep basin, it is both practical and elegant, and can be fitted with or without a vanity unit beneath it. Soaking in deep meditation or sharing the luxurious space of the matching acrylic bath is your choice. Complemented by the same bold angles the bath comes in a choice of four different sizes. The mood is up to you. Our discreet and practical bidets and WCs can be either floor standing or wall mounted- without handles, fast cleaning and economical, in their own quiet way they contribute to the efficiency of the bathroom. Furniture finish is your own personal statement, stamping your individuality on a masterpiece of creativity. From a choice of eight different finishes as well as the latest white wood finish, we are confident that the Villeroy and Boch Legato bathroom collection will satisfy your search for a bathroom of simplicity and refinement. 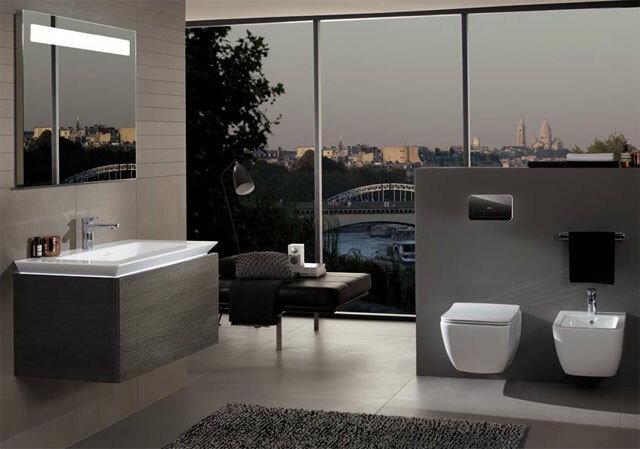 The Villeroy and Boch Vivia collection takes convenience a step further and addresses the individual’s needs and comfort in a modern bathroom, by adding ingenious extras. The need for more space is catered for with a deep washbasin, spacious shelf and console area which can be used seated. A pull out spray fitted on the tap makes shampooing hair easy, whilst the stool hides extra storage space. Shower use is simplified by the flush floor and the anti slip shower stool. Again, extra storage is hidden behind a door integrated in the shower panel. Although the Vivia collection is practical, style and luxury are not compromised. This entry was posted in Luxury Bathrooms, New Products, Villeroy & Boch and tagged bathroom collections, Legato, Legato and Vivia bathroom collections, luxury bathroom design, luxury bathrooms, Luxury Vanity Basins, Villeroy & Boch New Legato, Villeroy & Boch Viva, Villeroy and Boch, Villeroy and Boch New Legato Range, Villeroy and Boch New Viva Range, Vivia. Bookmark the permalink.